Some NFL players are using the summer offseason to work on more than just their conditioning and footwork. Through rookie symposia and boot camps offered by the league, they’re also getting a working knowledge of personal finance. “We’re fortunate to have high salaries,” says New York Jets outside linebacker Joshua Martin, whose most recent two-year contract was for $3.8 million. “But our careers don’t last very long.” Making the money last is one of the reasons he’s made it a priority to attend the optional personal finance boot camps put on by the NFL. The reality of their short careers is compounded by the fact that many of them are totally new to managing their finances. But you don’t need to make millions of dollars a year to benefit from the lessons they’re learning. Really? You need a budget in an industry where the minimum salary for a rookie is $465,000 (as of 2017)? 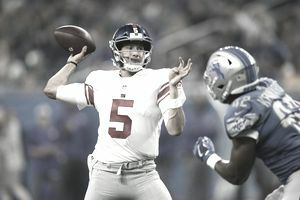 “You have to decide the things that are important to you that you want to do with your money,” says New York Giants Linebacker Devon Kennard. “Then you have to give the others up.” The players who get into financial trouble are those that spend big on everything, rather than picking their vices. Unless you’re among the game’s highest-paid players, “you can’t be a car person, a house person, a jewelry person, a person who wants to travel, and a person who wants to take care of your family,” he says. For Kennard, that meant prioritizing travel, a strategy that’s taken him to Costa Rica, Haiti, Jamaica, and Cabo, with the Bahamas and the Dominican Republic on the calendar this summer. For most people, a sudden loss of income might come in the form of a layoff or other job loss. For NFL players, it’s often a career-ending injury. “We have to remember our careers are short,” says Martin, and indeed, the average NFL career lasts just 3.3 years. This is compounded by the fact that — unlike the other three major American sports leagues — the NFL does not require fully guaranteed contracts. This means, for instance, that a four-year, $28 million payday could wind up paying out only the first year’s salary if a player suffers a serious injury or a drop-off in performance. You give any 19- to 22-year-old millions of dollars in one day and tell ‘em to go live life, they’re going to have ups and downs,” says Kennard. They’re also going to have plenty of people looking to separate them from their money, from needy family members to businesspeople looking for investments. The MMI curriculum focuses on separating emotion from business decisions — and also whether or not providing financial help to a loved one is helping or hurting an underlying problem. But, she says, “the most powerful thing is that budget.” That gives you a framework to explain to the people who are asking that your money is already earmarked for long-term goals. How Much Do You Really Earn Per Hour?